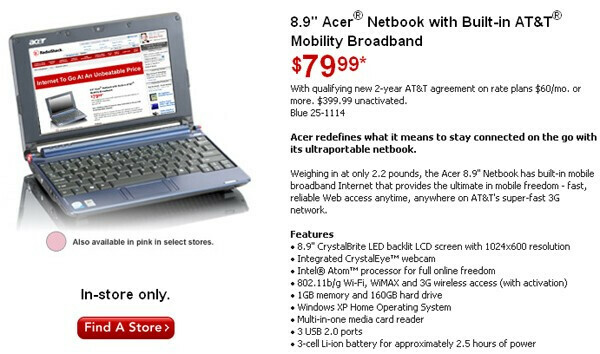 The price wars between netbooks have loomed large for some time now and Radioshack has taken the first step by slashing the price of their Acer netbook from $99.99 to $79.99. Industry analysts expect a boom in netbook sales, due to their innate sleek and compact form factor. Wireless carriers have teamed up to entice customers with subsidized pricing on two-year plans. At $60.00 per month, carriers will still be making huge profits out of these. Although the choice is only limited to a single Acer model as of now, you can at least take a pick and get a blue or pink colored unit. As sales take off, more players will appear and try to have a bite. Of course, increased competition will only benefit consumers, so fingers crossed, we hope we soon get more offers to choose from. How much would this model run from Acer and/or off-contract through AT&T? Is the discount steep enough? nope, they gotta make a profit. I bought one from VZW that has a razor on it. No way!!! I head the new acer notebook houses an entire mini-grooming center. i heard that razors are becoming obsolete and we can put fabric over our fingers and rub the hair off. Lists WiMax in the specs? Yea it sure does. I just may buy one.Don't like the $60 bucks a month though.